Did you know that there is a theme park in Japan that is sometimes called the Hollywood of Japan? This theme park, Toei Kyoto Studio Park, began its history in 1975 as a place where you could see film sets of period dramas and feel the action of them, not forgetting all the fun events that are held at the park. There are three points on how to enjoy the studio park: the film sets, the action, and the costumes you can wear. The film sets at the park reproduce the townscape of Edo and Meiji periods in great detail. They also have many shows by professional actors and there are many attractions that kids can also enjoy. What makes the studio park even more special is that you can also rent costumes, and wear a costume while you walk around the park, take pictures, and watch the shows! Toei Kyoto Studio Park is probably the only place in Japan where you can do something like this. Toei Kyoto Studio Park, which can be enjoyed by both men and women, young and old, is also recommended by this Sharing Kyoto writer! I hope you will all make special memories at the studio park. Let’s take great pictures at the Edo town! You can take pictures of all the buildings and things inside the studio park! You can walk among the film sets, so be sure to bring your camera with you! These film sets of the Edo period of 400 years ago are actually used in filming television shows and movies. Here you can feel like you really were in the Japan of old, and great care has been taken in replicating even the smallest details like the tools and curtains you can see in front of the town houses. Watch the shows! For free! The shows at the park are free for you to watch, and you can get to enjoy great samurai action like in this show “Tsujishinan,” and incredibly, the actors are professionals! The action is of such quality that many people just stop in their tracks when they see it. After the show ends you get to actually participate in the show, and be taught how to play a real samurai! Share the classic ninja parfait with your friends! There are many kinds of restaurants at the park, from places offering Japanese food to those offering snacks. This café, Kasahisakan, has a retro feeling reminiscent of the Japan of Meiji period. Here you can meet with the main star of the restaurants: ninja parfait! The ninja parfait has layers and layers of ice cream, whipped cream and other things, and there is enough for three to four people. Enjoy the studio park with the Easy Plan Transformation! For those who want to enjoy the studio park in an even more authentic way, I want to recommend the Easy Plan Transformation. The package is such that you get to choose a costume, and transform into a historical Japanese figure in only 15 minutes, without wigs and make-up, and then you get to walk around the studio park for an hour. There are 11 choices for adults and eight choices for children over 110 cm. Since you came all the way to the studio park, it is a great idea to wear a costume. *Costumes require an additional fee, and you cannot walk outside in case of rain. I was moved by how authentic all the film sets felt. This spot here is the Nihonbashi Bridge, and it is not only used by the people who come to the park, but also as a real film set. You can look great by just walking on the Nihonbashi Bridge. There are many points like this at the studio park where you can take great pictures. I hope you will enjoy the studio park and take great photos! Walking in the studio park I felt like I was really in the Japan of Edo and Meiji periods! The attractions that require　an additional fee are of course fun, but you can enjoy all kinds of things like shows with just the entrance fee. I hope you will enjoy Toei Kyoto Studio Park! A 2-minute walk from Randen Satsusho-mae and a 5-minute walk from Randen Uzumasa-Koryuji Station. Also accessible from JR Uzumasa Station, a 5-minute walk from there. Weekdays: 9:00 a.m.-5 p.m. Saturdays, Sundays, and national holidays: 9:00 a.m.-6 p.m. *These times may change depending on the season. Open daily except for five days every month. This is a spot I want to recommend to all those Japanophiles who like samurais and ninjas! 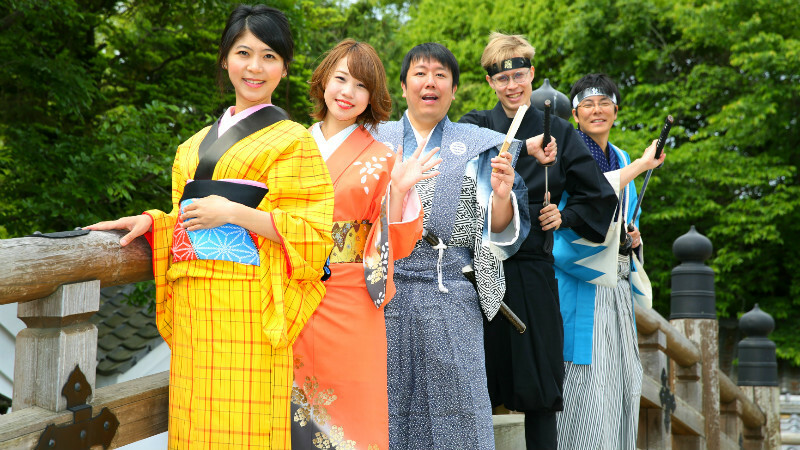 This is a place you can enjoy by just looking at the historical townscape, but you can also enjoy the park by watching and participating in the shows. Only Japanese, but the signs have English, Korean, and simplified and traditional Chinese.